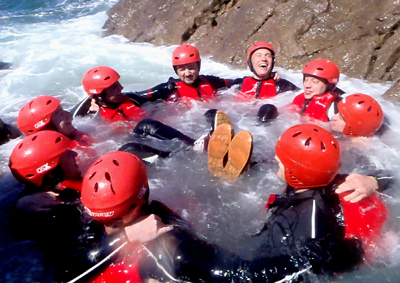 Stag parties and Coasteering equals loads of fun and excitement. If you want something different for your stag party to do then why not try coasteering from one of our fantastic venues in Wales. Our coasteering sessions always start gently but as we progress we can progress from easy but fun to extreme and exhilarating. We offer discount rates for any stag party that books our gorge walks and we can also recommend great accommodation in Wales. We have group accommodation and bunkhouse accommodation that will cater for you and your stag party in the style that you expect, including communal dining areas and very comfy beds. 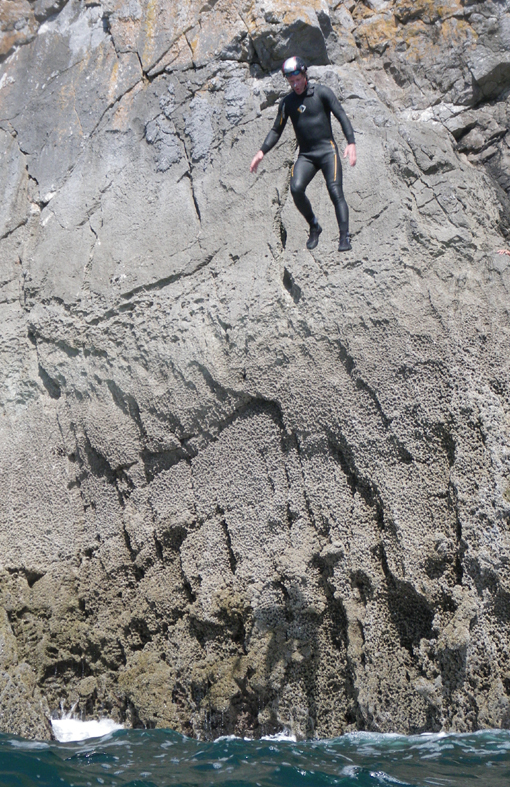 Each of coasteering venues in Wales is completely different, all have jumps, some have small wormholes to crawl through, others have cliffs to climb across deep water that you can climb all the way across or fall in if it gwets too tough. We can provide your group with all the excitement and fun you could ask for but always ensuring that you are kept safe and secure. 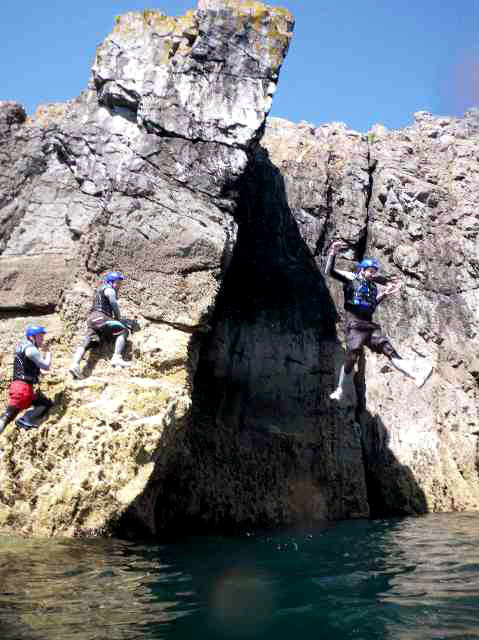 To ensure that everyone enjoys themselves, all of the elements in our coasteering (the climbs, jumps etc.) can be avoided out so no-one has to miss out because they have a fear of heights, tight spaces or deep water. 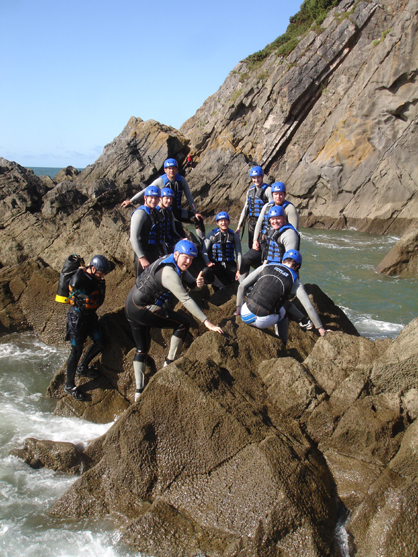 All our coasteering sessions are run with very experienced qualified instructors who are particular chosen for having a good sense of humour and an understanding of what stag parties want from their outdoor activities. 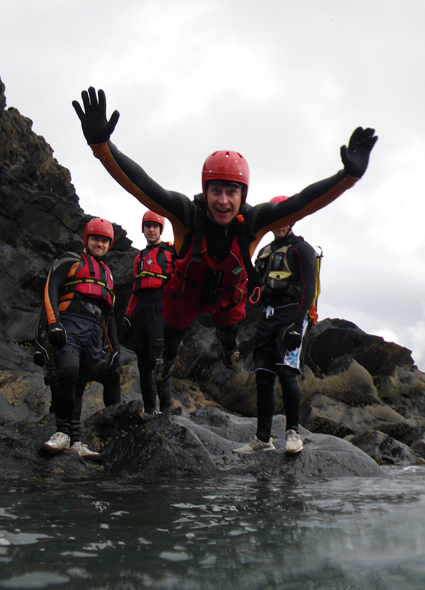 So if you fancy coasteering in Wales, the Gower and Pembrokeshire then give us a call. We can also tailor your stag weekend to suit you, so you can mix and match all our activities to get the best stag party adventure possible. 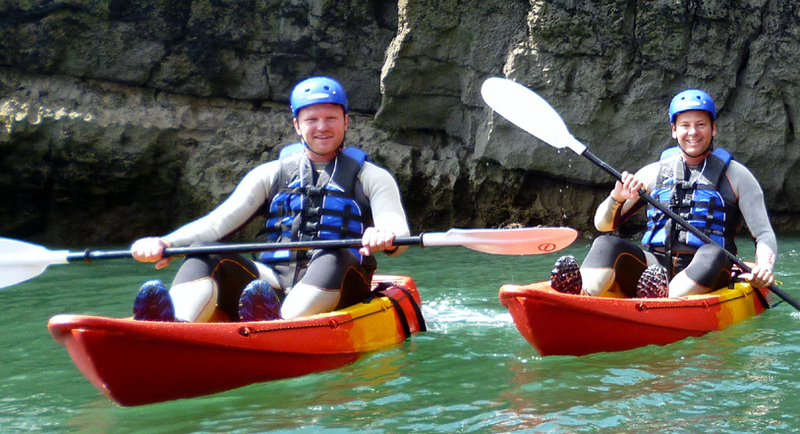 Have a look at all the other outdoor activities that we offer, just click on the "More Activities" link, then choose the ones that would suit your stag party then give us a call to sort it all out. If you still aren't sure what you want then contact me (Michael Downey) anytime and I can discuss the best options for you and your Stag Party. Hey, if coasteering seems too strenuous then we can run a "Team Challenge Event" where your stag party is split into teams with each team competing against each other by solving puzzles, problems and challenges. These can be anything from launching eggs as far as possible using some very basic equipment to being the fastest team to all squeeze a very dodgy sausage. 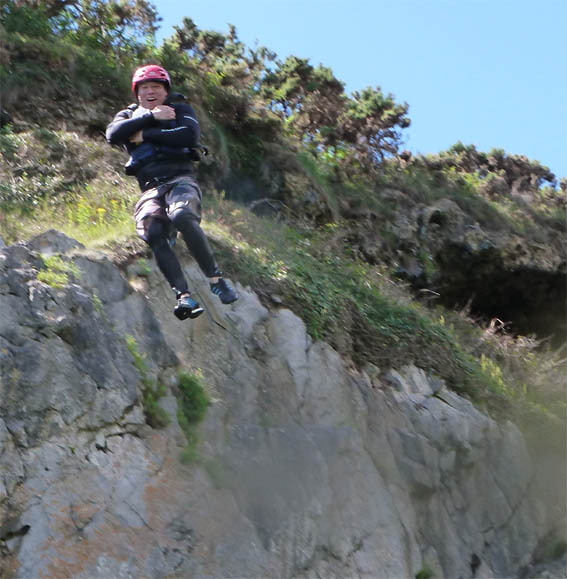 So if you want a fantastic stag party with the highest quality coasteering run by hugely experienced outdoor instructors with a great sense of humour, then give us a call. Stag Parties all love coasteering, it is a fantastic way to get to know everyone and as a team bonding activity it is second to none. We operate on 4 different locations across Wales so there is usually a coasteering location only a short distance from your accommodation. I just wanted to say a huge thank you to you and your colleague for the fantastic coasteering day we enjoyed on Friday. You were friendly and patient with us and we found it hugely challenging and rewarding. The whole party said they had a great time. Best hangover cure ever! Thanks again. P.S. The pics are great. What a fantastic afternoon. We were a small group of mixed ability stag-weekenders and couldn't have asked for more. Michael, our leader, was supportive of the group throughout, setting the pace to match our ability. Starting out we learnt the relevant techniques we'd need later in the day, with a focus on safety and teamwork. We then took it in turns to lead our way up the gorge with various targets set as we went along (like staying dry!). Highlights for me were the headfirst shimmy down a very narrow 45 degree angle tunnel, and a couple of heart stopping leaps from waterfalls. Provided with access to photos of the event on-line afterwards. Whole event was safe, professional, and most importantly a great deal of fun! What a fantastic afternoon. We were a small group of mixed ability stag-weekenders and couldn't have asked for more. Michael, our leader, was supportive of the group throughout, setting the pace to match our ability. Starting out we learnt the relevant techniques we'd need later in the day, with a focus on safety and teamwork. We then took it in turns to lead our way along the coast with various targets set as we went along(like not falling in!). Provided with access to photos of the event on-line afterwards. Whole event was safe, professional, and most importantly a great deal of fun! Just wanted to say thank you very much for a spectacular day, we all thoroughly enjoyed ourselves and want to go gorge walking again immediately! What topped it off was the fact that you're quite obviously very knowledgeable and passionate about the activities and you take a true interest in teaching others your knowledge and skills - it really was a fantastic experience that has left me hungry for more! My father is 60 this year and has always wanted to go gorge walking so am looking at booking something for later this year. What's your availability like? 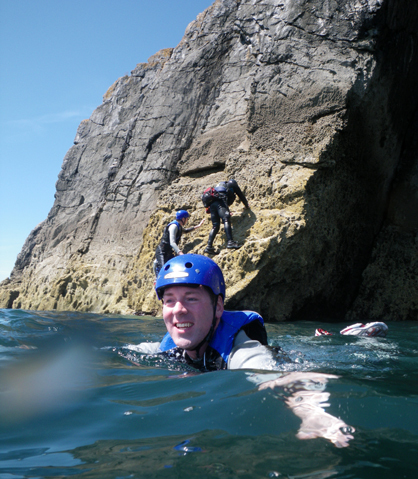 Michael - I was on the coasteering weekend that you lead this Saturday just gone (seems an age ago already!) and wanted to write to you with my thanks and to express how fantastic the day was. As the organiser of the stag party, I found you to be the perfect guide-host in a glorious part of the world. You clearly had the knowledge of the area down to a Tee, kept people safe and most of all, you made it a very, very friendly and FUN experience. It is one, if not THE, best activity based day out that I have had - and that includes at least 4 extremely happy and activity bound years I spent in the Air Training Corps as a youngster that the claim above is competing against!! So, once again, many thanks and please do keep up the great work! Hi Mike, Just wanted to say thank you very much for a spectacular day, we all thoroughly enjoyed ourselves and want to go again immediately! What topped it off was the fact that you're quite obviously very knowledgeable and passionate about the activities and you take a true interest in teaching others your knowledge and skills - it really was a fantastic experience that has left me hungry for more!